Music, arts, crafts, dancing and more! Kids can participate in all kinds of events this weekend, including educational opportunities as well as fitness events. All happening this weekend in and around Boulder. The Hidden Treasure 2 is hosting a “Learn To Sew For Kids Class” back by popular request. Kids are never too young to learn to sew and here is a great opportunity for them to get started. In this class they will learn to sew by making their own tote bag! Betty will be their instructor. It will be a great time for sure! To register please call the shop at 720-340-9951 or got to www.thehiddentreasure2.com. Class sizes are limited so pre-registration is required to reserve your spot and have the needed supplies for class. Join Firehouse Art Center every Saturday in February for a Portrait Painting class with Mister Mario! Learn basic techniques and skills needed for this unique form of art. All while receiving help from Mister Mario. Bring your kids and join Jaime S. as she leads you through yoga postures through a combination of story, dancing, and play. Adult must accompany child. Space is limited. Purchase your ticket(s) and reserve your spot today. Take a break while your kids learn skills on trapeze, aerial fabric, sling, acrobatics and so much more at Frequent Flyers Parents Night Out! 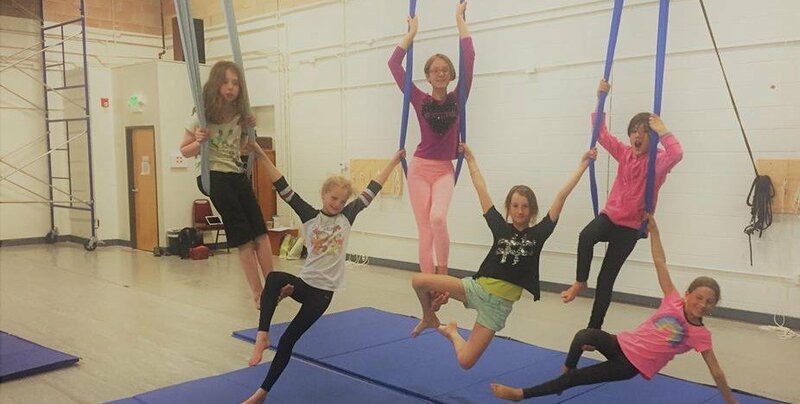 No experience is necessary to join this two hour “mini camp.” This is a great opportunity for a new student to try aerial for the first time. Gather your friends and family for a morning of exercise before the Super Bowl on Feb. 4 at the Big Game Fun Run! Courses will vary in 1, 2 mile, & 5K distances at the Broomfield County Commons Park. BONUS: All participants will receive a FREE two-ticket voucher (while supplies last) to a Denver Nuggets, Colorado Avalanche or Colorado Mammoth game for registering. Vouchers will be handed out on race day.